Corporate Realty, Inc. is proud to present our seventh annual Greater New Orleans Office Market Report. 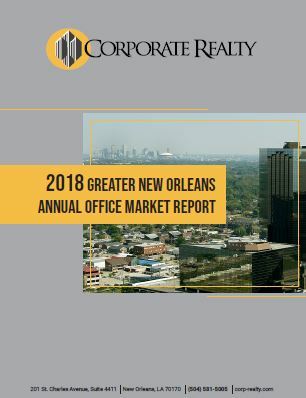 We publish this report to give the reader a broad understanding of the Greater New Orleans office market as well as specific information about occupancy and rental rates of each office building that contains at least 20,000 rentable square feet (rsf). With data from 2012 – 2018, this report offers a snapshot of the current market and analyzes market trends. Most graphs in this report feature data from 2013, 2017 and 2018 to illustrate both immediate and long-term change. Click here to download the report from our reports page. In addition to this annual report, Corporate Realty publishes quarterly reports of the office market compiled by Bruce Sossaman. These reports can be found alongside previous annual reports at corp-realty.com/reports/. Please contact one of the many Corporate Realty office specialists if you have any questions or would like more information about the Greater New Orleans office market.